No charge for cancellations 30 days prior to the date of arrival. Reservations cancelled 3 days prior to the date of arrival or Not Show will incur a 100% charge. All our prices are VAT included. *These conditions are not valid or applicable for Special Offers or Advance Purchase, which have their own and particular Terms & Conditions. Kindly be informed that in order to confirm your reservation, 50% of the total amount will be charged at least 30 days prior to arrival. 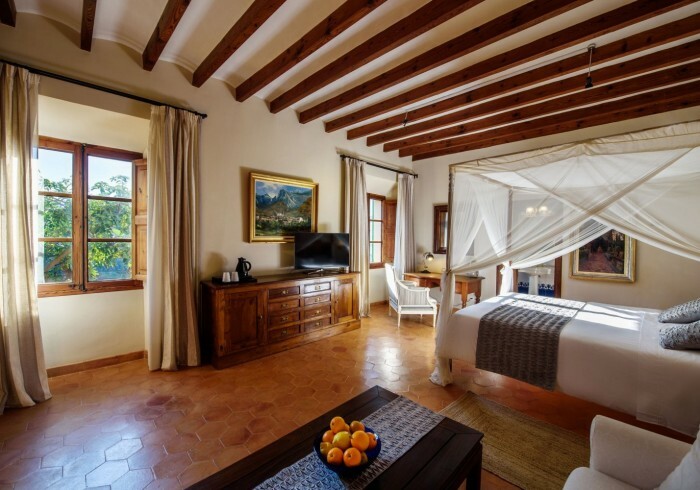 SON GREC Petit Resort recovers the History of an original eighteenth century Mallorcan house (completely renovated) to suit the comfort and requirements required by every XXI century sybarite traveler. Free Wi-Fi in rooms and common areas, private parking included, outdoor swimming pool, gym, wellness, gourmet restaurant (customers only), HD satellite TV with over 20 international channels, reading areas, private dining, activities… Local flavor and international mentality. Located in Sóller, the heart of ‘Serra de Tramuntana’, essence of Mallorca.